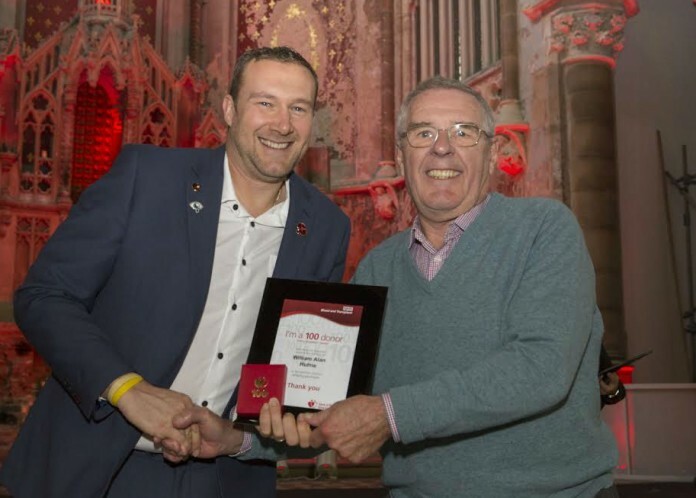 Well-known retired local plumber, Alan Hulme was recognised by NHS Blood and Transplant for his loyalty and commitment at a ceremony held at Gorton Monastery on 11 November 2016 where he received an award and certificate for reaching his 100th blood donation milestone. Alan, who will be 80 next September, was born on Park Lane in Poynton and has lived in the village all his life. He began donating blood in 1958 when he was just 21 years old and has regularly attended the local donation service ever since. The lifesaving efforts of 37 blood donors from the North West region, who had collectively made an amazing 4,000 donations, were also honoured with commemorative medals at the ceremony. Each blood donation can save the lives of up to three people. If a donor has given blood 100 times, they have potentially helped save, or improve the lives of up to 300 patients. Out of the three per cent of the eligible population who give blood, just one per cent reaches 100 donations. Alan knows only too well how critical blood can be in saving a life as his wife Sheila was taken poorly after the birth of their first daughter and required a blood transfusion to save her life. Alan hopes that his achievement will encourage others to donate to this worthy life-saving cause.